Successfully Added T95Z Plus TV Box - Amlogic S912 CPU, 2GB RAM, 4K, Android 6.0, Kodi 16.1, Dual Band Wi-Fi, SPDIF to your Shopping Cart. The T95Z Plus is certainly not your standard boring TV Box. 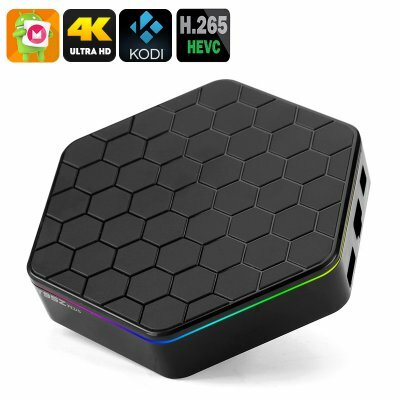 Having a hexagonal shape and honeycomb patterned top this mini TV box with its cool LED lights certainly stands out from the crowded market. Coming with a fairly comprehensive remote control that includes 4 buttons for use in conjunction with your TV it's a super little media player with a unique and stylish design. Once powered on a front LCD display brings up the time and the remote will even let you scroll through the LED colors so you can draw attention to this stylish new addition to your home that will light up with cyan, blue or green lighting if you wish. Making use of the popular Amlogic A912 Octa Core 2GHz Chipset and having 2GB of RAM the T95Z Plus is a well kitted out TV box that delivers in spades when it comes to performance and will serve up 4Kx2K ultra HD resolutions with ease, so you're guaranteed stunning visuals. Having a powerful setup there is more than enough processing capacity for the best movies, fantastic games and multitasking there's not much this mini media player can't do. It comes fully kitted out with an Android 6.0 OS and the Kodi media player is preinstalled, putting a wealth of apps and free entertainment at your fingertips as well as support for a plethora of media files. When it comes to connectivity the T95Z plus has a Gigabit Ethernet port and a built in dual band Wi-Fi antenna so you don't need to locate it next to your router to enjoy super fast wireless network speeds. The SPDIF optical port is all you need to connect to your speaker system for a full immersive experience with games and film. The R95Z Plus Android TV Box comes with a 12 months warranty, brought to you by the leader in electronic devices as well as wholesale TV Boxes.. Fairly easy to set up. Just like some other "gadgets" it has its operational quirks which is part of the learning curve. Works well and am enjoying it.